To undertake research activities for truly useful software engineering, GRACE Center conducts solution-oriented joint research through industry-academia collaboration. The Center is also active in the human development and exchange that are essential for utilizing the research results in industry and for enabling business incubation. The following three points are vital for encouraging the use of leading-edge software engineering research results (technological innovation) in business and for enabling business incubation. GRACE Center flexibly launches and promotes joint research in which technical innovation is used to address business issues proposed by companies. The joint research serves as a practice ground for bringing research results and human resources closer to business incubation, while at the same time offering opportunities for the business side to make evaluations. 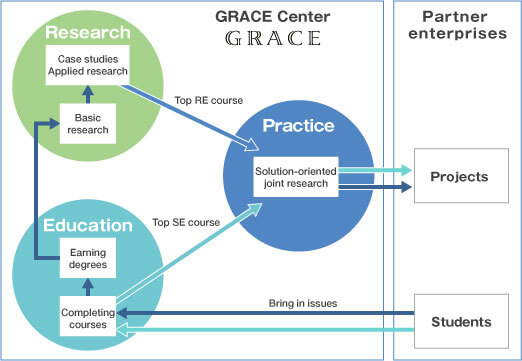 By tying up with the educational functions of the GRACE Center, “solutions-oriented joint research” serve as a forum where Top SEs, who support business incubation, and Top REs, who are capable of enabling technical incubation, compete with each other to solve the issues. GRACE Center cultivates human resources capable of bridging the gap between research and businesses on their own.